It may not sound like groundbreaking stuff - a quaint documentary about a custom guitar shop in the heart of Greenwich Village - but make no mistake, Ron Mann’s latest laid-back documentary, Carmine Street Guitars, is the most unassuming, sneakily beautiful, goddamn treat of a film I have ever seen. Hyperbole? Nope, not to me! Will you feel the same way? That depends on many things about you, most obviously, what is your taste in music? Will the film’s cast of crazy cool customers appeal to you personally? Except at the end of the day it has very little to do with whether or not the film’s roster of musical treasures - local giants like Jim Jarmusch, Lenny Kaye, Bill Frisell, Eleanor Friedberger, Nels Cline, and on - float your boat, as much as what said tastes say about your character and the philosophies that shape it. Carmine Street Guitars is a place for peas in a pod. Oftentimes it is the pod. Carmine Street Guitars is a custom guitar shop in Greenwich Village that repurposes some of the oldest wood in New York City from pre-civil war era taverns to historic landmarks like the Trinity Church, which has stood since 1846, into impeccably crafted instruments to be played by those who can appreciate them most. Rather than cashing in on these invaluable items, shop-owner and craftsman Rick Kelly is all about ensuring that these artifacts are given appropriate homes. Though stores inherently exist to yield the mighty buck, Carmine Street Guitars is an enterprise that deals in significance and preservation. Not only do Rick’s guitars preserve the literal bones of New York City, his space preserves lineages of musicianship and artistry - traditions, styles, philosophies - and provides one of the many necessary spaces bohemia needs to house and keep it all together. Sadly, holy spaces of this ilk are dying. A growing city infrastructure is a malignant thing, intent on destroying these old ways, so to squeeze out as much green from a square foot as possible. Thankfully, there’s another kind of preservation at work here, and it’s with the cinematic immortalization of the documentary. Ron Mann’s film, Carmine Street Guitars, like the store itself, is a gem. It contains the spirit of Rick’s endeavour and what it means to so many people, while delivering a simple story in which soulful depth hovers in the air. I had the great pleasure of discussing this achievement with Ron at the Vancouver FIlm Festival. Our talk spans a variety of topics, from the shop, to Ron’s awesome career, to the many musicians and films that we mutually adore and share as a sort of cultural DNA. Some of these people appear in his film while others may just as well have. It is a shared DNA hardly unique to the two of us, and there are a million customers who could have been featured in this film, or who walk into Carmine Street Guitars every day; like-minded souls capable of sublime expression. Rick builds their instruments, their battle swords, their extensions, the tools that allow them to shine for all mankind, and thanks to shellac and celluloid, for all time too. Anyone who enters the store senses these vibes immediately. It’s an ‘if these walls could talk’ thing and the walls of Carmine Street Guitars, like the music that permeates them, communicate profundities words cannot. It’s where the bones of walls that for decades housed the invaluable happenings of a metropolis become the bones of new guitars that simultaneously contain history while heralding a creative life to come. Rick builds instruments to be cherished or gifted to those you cherish; passed down to a lineage of souls who too will learn of these ways and traditions. Thankfully, in the last five years, Rick has found a worthy apprentice in Cindy Hulej, who offers hope for future years of holy preservation on Carmine Street. In hundreds of years, many of these instruments will still exist, as relics of relics of holy ancestry. 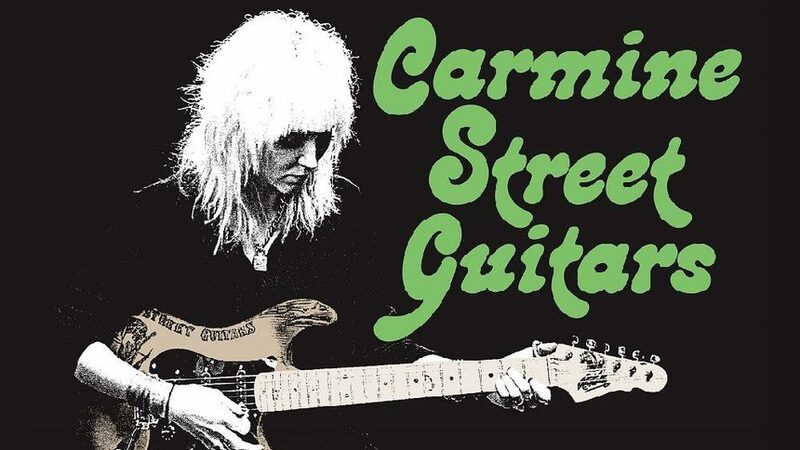 Ron’s film, Carmine Street Guitars, will also still exist, and in a disappearing landscape of fading significance, this fills me with hope. Some things are born of a foundation strong enough to last.